1950 Bowman Baseball brought the line into full glorious color. And while the set might not have any top-tier rookies, that shouldn't take away from it attractive design and solid crop of early cards for several Hall of Famers. The checklist has 252 cards, which is up slightly from 240 in 1949. 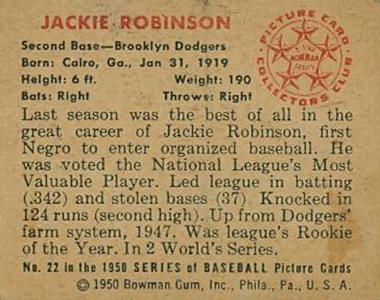 The set is home to some of the first cards of both Jackie Robinson and Yogi Berra, who are among the most popular (and valuable) cards in the set. Other key players include Ted Williams, Warren Spahn, Bob Feller, Roy Campanella, Pee Wee Reese and Duke Snider. Because he's the first card in the 1950 Bowman Baseball set, Mel Pamell can also command strong values because of the rubber band effect. Often left on the top of a rubber band-bound stack, the card took the brunt of the damage at a time when condition and collectibility weren't considerations. 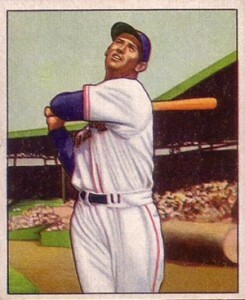 The key rookie cards in 1950 Bowman Baseball are Don Newcombe and Hank Bauer. The set continued to evolve as far as design goes. 1948 Bowman Baseball brought plain black and white photos. That moved to colorized photos the following year. Yes, they had some color, but it's limited. 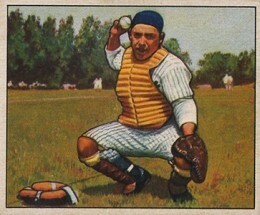 1950 Bowman opts for paintings instead of photos, but the trade is full color. The paintings are based on photos and go for a realistic approach. Cards are smaller than what's standard today, measuring 2 1/16 by 2 1/2 inches. Considering their age, the set isn't overly expensive. The lack of a major rookie card helps. That would change for 1951 Bowman, which has both Mickey Mantle and Willie Mays rookies. 1950 Bowman #229 FRANK FRISCH Chicago Cubs - PSA 6 EX-MT - Rare HOF Beauty! 1950 Bowman #230 BILL SERENA Chicago Cubs - PSA 5 EX - Rare Beauty! 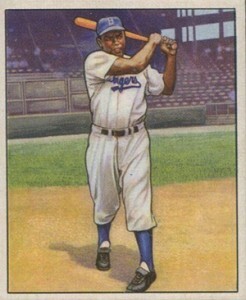 1950 Bowman 238 Vernal Jones. PSA 7 NM. (TX74800DXM). 1950 Bowman #237 BILL SALKELD Chicago White Sox - PSA 6.5 EX-MT+ - Rare Beauty! 1950 Bowman #244 DALE COOGAN Pittsburgh Pirates - PSA 5 EX - Rare Beauty! 1950 Bowman #249 GEORGE STIRNWEISS St. Louis Browns - PSA 5 EX - Rare Beauty! 1950 Bowman #252 BILLY DeMARS St. Louis Browns - PSA 5 EX - Rare Rookie! Question: How do I identify an original card from ia reprint? 1950 Bowman Baseball #67 WIllie Jones Phillies Nm PSA 7 SUper Sharp Card!